In 2010, Dr. Dan Benishek won an open seat vacated by democrat Rep. Bart Stupak against democrat state Rep. Gary McDowell 52-41 and won the rematch 48.1-47.6 in 2012. He beat former general Jerry Cannon in 2014. Benishek pledged to serve only three terms, but announced that he would run again before changing his mind and retiring. Candidates include moderate state senator Tom Casperson and former senator Jason Allen. Others considering are state senator Wayne Schmidt and state reps Lee Chatfield and Peter Pettalia. Democrats are touting former Michigan democrat chairman Lon Johnson, a liberal who bought a small house in Kalkaska County. Cannon will also run again. Republican former state rep. Bill Huizinga won a close primary in 2010 to replace Pete Hoekstra, and was easily reelected in 2012 and 2014. Since then he has generally voted a fairly conservative line. 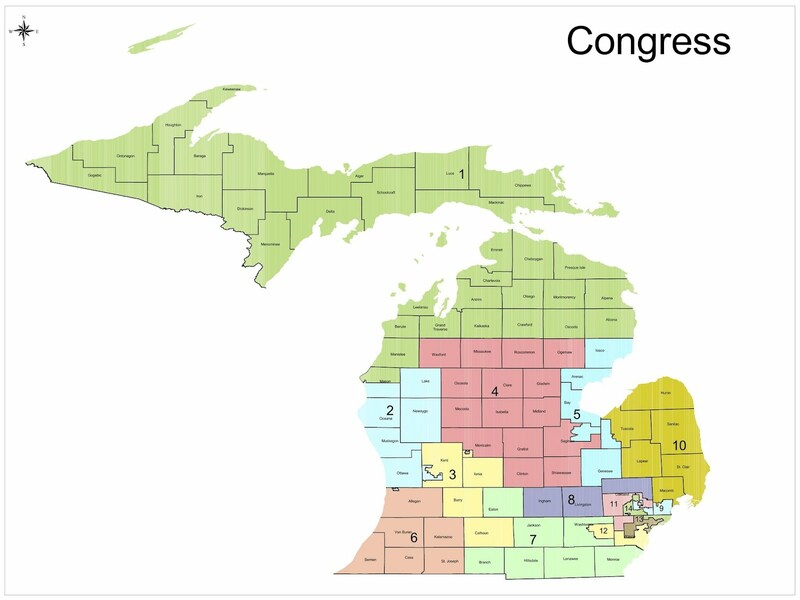 This remains the most Republican district in Michigan. Republican state rep. Justin Amash won the primary to replace moderate Republican Vern Ehlers, in 2010. Amash is a libertarian in the mold of Rep. Ron Paul. He has made some enemies in Washington, and ticked off Right to Life and the NRA. He defeated moderate businessman Brian Ellis, who had significant self-funding, 57-43 in the 2014 primary. Republican state senator John Moolenaar of Midland defeated self-funding businessman Paul Mitchell and Tea Partyer Peter Konetchy 52-36-11 in the 2014 primary to replace retiring congressman Dave Camp. Former Genesee Treasurer Dan Kildee succeeded his uncle Dale Kildee in 2012. Moderate Republican Fred Upton has won by wide margins since defeating conservative Mark Siljander in 1986. Upton became Chairman of the House Energy and Commerce Committee in 2010. Upton defeated democrat Mike O’Brien 2010, and Western Michigan University professor Paul Clements in 2014. These races were closer than Upton’s previous 20-40 point margins. Clements is running again in 2016. District 7 (south-central Michigan) Likely Republican. Republican Tim Walberg defeated liberal democrat Mark Schauer in a hard-fought race in 2010. This followed Schauer’s defeat of Walberg in 2008, Walberg’s defeat of RINO Joe Schwarz in 2006, and Schwarz’s winning a divided Republican primary to replace Nick Smith in 2004. Walberg defeated democrat attorney Kurt Haskell in 2012 and former state rep. Pam Byrnes of Washtenaw County in 2014. He is being challenged by democrat state rep (2012-present) Gretchen Driskell, who won 53% and 56% in her Washtenaw district. Former state senator Mike Bishop of NE Oakland beat state rep. Tom McMillin 60-40 in the 2014 Republican primary to replace retiring congressman Mike Rogers. Bishop defeated Ingham County Treasurer Eric Schertzing in the general. Actress Melissa Gilbert, who recently moved to the district, is running as a democrat. Democrat Sander Levin has represented this district since 1982. Levin is more liberal than the district, but he is popular enough to win here as long as he wants. He may be succeeded by a less liberal Macomb county democrat. Republican Candice Miller is retiring. Republicans running to replace her include conservative state senator (2010-present) Phil Pavlov, who has represented most of the Thumb portion of the district, conservative former senator (2002-2010) Alan Sanborn of northern Macomb County, and Shelby Township (Macomb) Treasurer Michael Flynn. Also running is rich self-funding businessman Paul Mitchell, who lost the Republican primary in district 4 in 2014 and led the fight to defeat proposal 1, a large tax increase. Also considering running is solid conservative state senator (2010-present) Jack Brandenberg. Establishment Republican David Trott defeated Tea Party Republican Kerry Bentivolio 66-34 in the 2014 Republican primary. Bentivolio became an “accidental congressman” in 2012 after incumbent Thad McCotter was disqualified in a petition fraud scandal. Trott defeated former diplomat Bobby McKenzie in the general. In 2014, democrat Debbie Dingell easily replaced her husband John Dingell in Congress after his 58 years (!) in office. This district has been represented by democrat John Conyers since 1964. Conyers’ image has been tarnished since his wife Monica, formerly Detroit city council president, pled guilty to bribery and served time in federal prison. He won only 55% in the 2012 primary. In 2014, Conyers was nearly disqualified due to having signature gatherers who were not registered to vote, but a judge ordered him back on the ballot. He defeated pastor Horace Sheffield 74-26 in the democrat primary. Detroit City Clerk Janice Winfrey is challenging Conyers in the primary. In 2014, Southfield mayor Brenda Lawrence defeated state rep. Rudy Hobbs, and former Congressman Hansen Clarke 36-32-31 in the democrat primary for the seat held by Gary Peters, who was elected to the US Senate. This district has had four different representatives (Lawrence, Peters, Clarke, and Carolyn Kilpatrick) in the last four cycles. Somebody please correct me (and I'm not an Amash fan boy by any means)...but wasn't Justin the only House Representative from our state to vote "No" on both the single most destructive omnibus spending bill in this country's history AND the most damaging education reauthorization act to effect our children...ever? I'd also like to be educated on who voted to buck Uncle Fred recently as head of (arguably) the single most important committee in Washington...as he held hands with Democrats/Obama and allowed the signing away of long term foreign contracts locking up the national treasure energy reserves that we've been crying about not having for decades. Let's see... they've cut off our last chance for budgetary redemption...enslaved our children to the Common Corruption brainwashing that we've already witnessed personally this year...and sold every ounce of our most easily obtainable energy resources to the highest bidder using our next most scarce resource (water) that they aren't even required to quantify (as we must do). If we cannot knock out an establishment Republicans on even any 'one' of the above travesties..pray tell what the top 3 issues this year will be in the above primaries? Need to see you here more often.